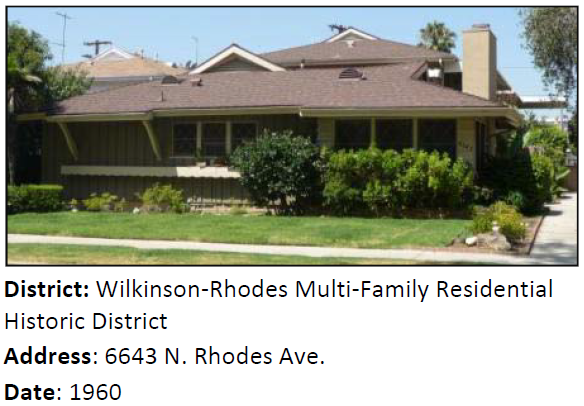 Traditional Ranch architecture applied to a small apartment complex that disguises the two story portion by siting it farther back. The buildings were designed by Maxwell Starkman and developed by Bob Symonds (the developer of Valley Plaza). When I first saw North Hollywood, I was coming out of a subway portal that was only finished in the year 2000. Surveying that spot today, almost everything you see is newly built. An electronic billboard nearby even makes it feel futuristic. There is one important exception however: an old rail station, no longer in use, hints at the past. When the Southern Pacific Railroad reached the San Fernando Valley (SFV) in 1874, it was a game changer. Connection to a national transportation network meant that the world established by Spanish missionaries and the Tongva would be profoundly transformed. Grain farming and livestock grazing began to give way to suburbs and shopping centers as the North Hollywood and Valley Village we know today continued the process of reinventing itself. The North Hollywood subway station, at Lankershim and Chandler Boulevards is in the same place as the historic core of the town of Toluca. Founded by Isaac Lankershim Jr. and his brother-in-law I.N. Van Nuys, Toluca was the result of Lankershim’s inheritance of his father’s ranch lands. The duo, whose last names are instantly recognizable to anyone who has done much navigating of the streets of the SFV, clustered their town around the Southern Pacific rail station and modest wood framed houses began to dominate the landscape. By 1896, the town had renamed itself Lankershim, and was on the cusp of major changes. The 1910s saw the introduction of Pacific Electric Streetcar service that connected the survey area to Hollywood and Downtown Los Angeles. 1913 saw the completion of the Owens Valley Aqueduct, ensuring the growing City of Los Angeles an adequate water supply for decades to come. 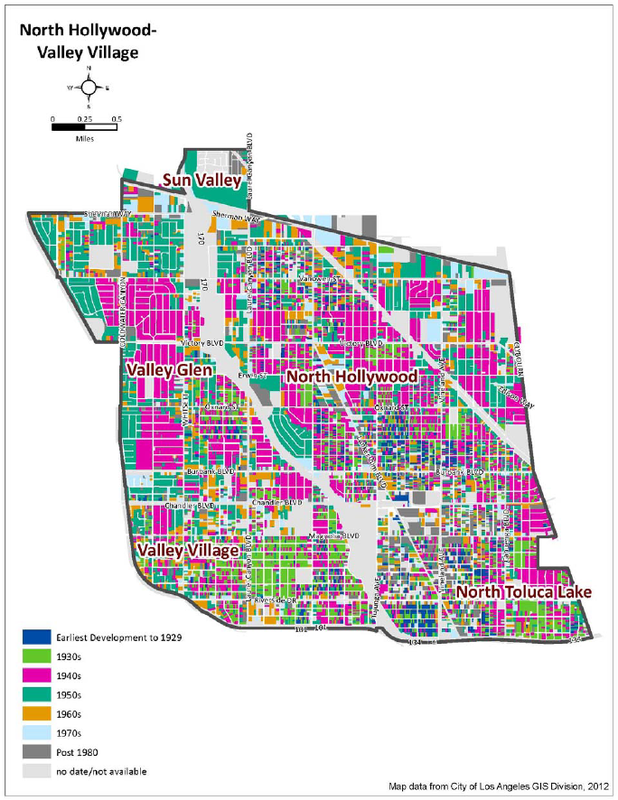 Around the same time, the Los Angeles Suburban Homes Company bought up much of Van Nuys’ land and pushed an aggressive program of suburban development. The study area was annexed to the City of Los Angeles in three separate actions from 1915 to 1923. Hoping to benefit from the association with Tinseltown, Lankershim re-dubbed itself again in 1927 as North Hollywood. The association with the film industry was deeper than the new name. The first film studio in the SFV was established just south of the survey area in the Cahuenga Pass and many film industry workers settled in North Hollywood and Valley Village as a result. A Jewish population started to call the area home as well, setting up Adat Ariel, the first Jewish congregation in the SFV, in 1938. More big changes kept happening before WWII. As three airports opened nearby, aerospace jobs came to the survey area which also meant workers moving in. Some housing was built specifically for these workers as was the case with the Paul R. Williams designed Rancho Vega garden apartment complex. A large flood in 1938 led to efforts to channelize local waterways, including the Tujunga Wash.
Whites-only racial covenants were common in most SFV housing until the 1970s, but the study area was one of the more diverse places because the older housing stock associated with Toluca/Lankershim was perceived as less desirable. This is especially true east of Vineland and south of Magnolia. People of Mexican, African-American and Japanese descent moved in. The area was also a bit of a hot spot for lesbians as the piano bars and lounges they frequented did not experience the same level of police raids as other spots closer to Downtown. After World War II the survey area’s population boomed, mirroring the SFV trend. Planning efforts to preserve some belts of agricultural land couldn’t gain any traction as developers rushed to satisfy the explosive demand for housing. The result is a landscape of single-family neighborhoods with multi-family buildings along major streets, early examples of neighborhood and regional automobile-oriented shopping centers, and industrial clusters near infrastructure like railroad tracks. 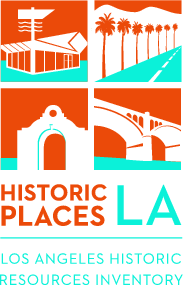 The report notes that “a large amount of pre-loaded data [was] contributed to the City by community through MyHistoricLA”. Much of it focused on housing that exemplified widespread patterns of development in the area or the entertainment industry. We really appreciate your historic place suggestions and more are always welcome! Below are some highlights from the report. Click a picture to go into slideshow mode and see my full captions. Enjoy! This vernacular hip roof cottage is a good example of the earliest intact residential development in North Hollywood. This district reflects the growing importance of automobiles (signage, rear parking) in its period of significance while still keeping a foot in the pedestrian oriented past (sidewalk orientation). After World War II garden apartments played an increasingly important role in suburban multifamily housing. These are Minimal Traditional in style and designed by the firm of Wharton and Vaughan. A Traditional Ranch house with interesting touches on and around the garage. It is found in a largely intact district in Valley Glen. Mid-Century Modern motels like this one sprung up for travelers who took Lankershim to Route 99 (the LA area predecessor to the Golden State Freeway). A Googie-style Denny’s Restaurant designed from plans by Googie masters Armet and Davis.